God has brought me close to three beautiful mommas of young children, three wonderful friends with whom I enjoy sharing prayers, laughs, meals, coffee, deserts that involve chocolate and berries, and messes that only 3-10 yo children can make. Yesterday we had a conversation about the difference between the battles and struggles mommas of young children have to deal, with those that mommas of adult children face. The seemingly small battles are not small battles at all. The problem is that sometimes we are not used to see the big picture, the whole story; we are so tangled up in our daily duties and to-do lists, that we forget what we are actually doing with those little ones we have at our table every morning spilling milk on the floor. Keep this in mind, every decision we face, every “no,” every “yes,” every step we take (or not take) is important because day after day, over and over, we are building character in our children’s lives. The over-looked tantrums of a two year old boy, will eventually turn into the slamming of a door of a teenager, and then into a husband who yells at his wife. With every decision, with every moment of discipline, with every hug, with every book we read aloud, and with every prayer we are building an adult’s character. And if you are the mom of adult children, please, don’t despise the struggles of younger mommas. Encourage them instead to persevere, to keep pressing on. Remember that you were once changing diapers and asked in every single online forum help on how to choose the best how-to-read curriculum; remember that you didn’t know how to teach your little one how to be polite and look in the eye of the elderly woman at church; remember that every time you asked your child to turn off his game-boy when having company (iPods were not in the market yet) was a big thing. Each struggle, each decision that my husband and I have made in the last 20 years has brought us to where we are now with our young adult children. There were no short-cuts; it has been a day after day race. So be encouraged; what you do today is important, is your vocation, is what God has appointed for you to do in this season. You are not just doing ordinary things. You are building lives. Read that again: You are building lives. Your words and example, your time and prayers, your hugs and the correction you firmly give in love, all are needed in the process. Don’t be weary of doing what is good. 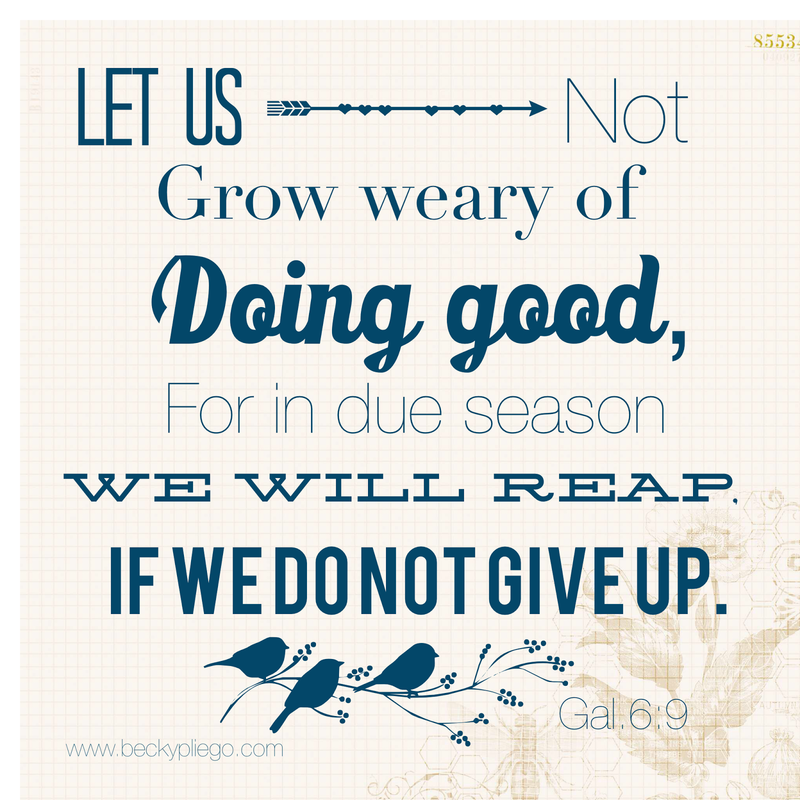 God has promised that in due season you will reap, if you don’t give up. This entry was posted in Being a Mom, Daily Life, Exhortations, Family Table, Grow_Build_Edify, Little_Souls by Becky Pliego. Bookmark the permalink.